순두부 Sundubu = soft tofu. 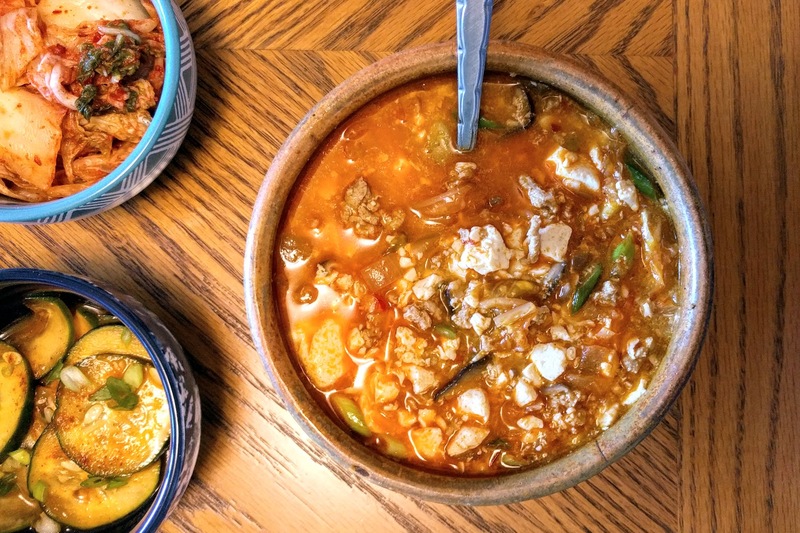 찌개 Jjigae = stew. Naturally, this dish revolves around Korean soft tofu, which is an extra-silky tofu that’s sold in adorably plump tubes. It’s typically paired with meat or seafood (like pork, chicken, clams or shrimp) and made quite spicy with fresh, dried and/or fermented hot chilies. Most of the recipes I found called for a pretty long ingredient list. 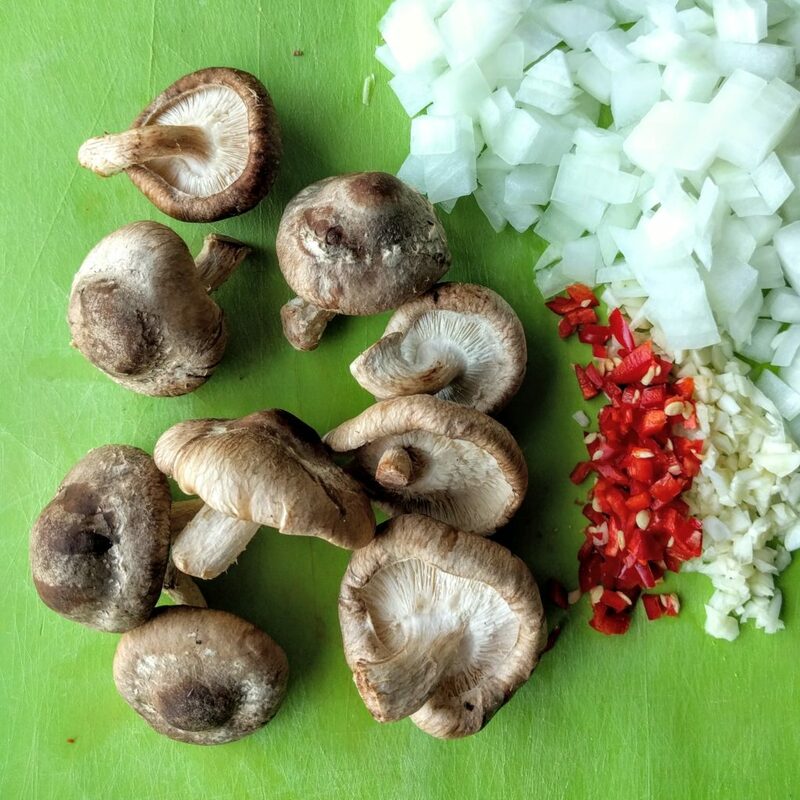 The version I describe here is certainly less authentic, but it simplifies the job while still hitting all of my favorite flavor notes: onion, garlic, hot chilies, earthy mushrooms, toasted sesame oil, and, of course, kimchi. Most recipes also seem to limit cooking time to a quick stove-top simmer, but I decided to take advantage of my pressure cooker to really slam all of those strong flavors together. And when you open up the lid to a swiftly bubbling stew, you have the perfect conditions to crack in an egg. It’s the traditional finishing touch to enrich the dish and make it even more silky and savory. This stew can be made with any type of meat or poultry - chopped into bite-sized pieces, or ground. The stew in these photos was made with ground turkey. The stew will be quite spicy if you use all 3 of the pepper ingredients (fresh jalapeno, dried chili flakes, and fermented gochujang paste) - choose the ingredients you have available, and scale down for a milder spice level if desired. Add the oil to the pressure cooker to cook over medium heat (press the 'Saute' button to begin cooking at medium saute heat). When the oil is hot, add the chopped onion, garlic and jalapeno, and saute until the onions are soft/translucent. Stir in the gochujang and/or gochugaru, then add the meat and continue to cook, stirring occasionally, until lightly browned. Add the mushrooms, soy sauce, sesame oil, kimchi and broth (and kombu, if using). Cut the soft tofu tube about two inches from one end, then slide the tofu into the soup and gently break it apart with a spoon. When the cooking time is complete, allow the pot to de-pressurize naturally for at least 10 minutes before opening the lid. Remove the kombu, if using. 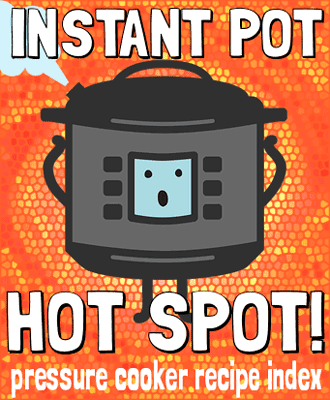 Crack an egg into the soup and let it cook for 1 minute (if your soup is no longer bubbling hot, turn on 'Saute' mode to finish cooking). Stir and serve hot, topped with green onions, accompanied with rice and your favorite "banchan" (side dishes). 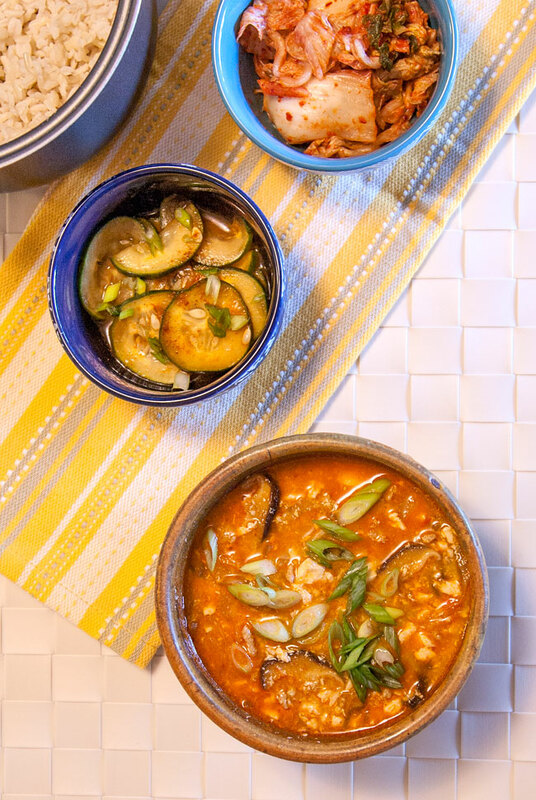 One of the best, easiest instapot recipes if you love korean flavors! I have cooked this twice now using my Crockpot Express and it comes out very tasty. I always add extra heat, and do not expect it to be very soupy- it’s definitely a stew! Love this recipe. Dealer’s choice! I used chicken stock. I have not been receiving your recipe emails. 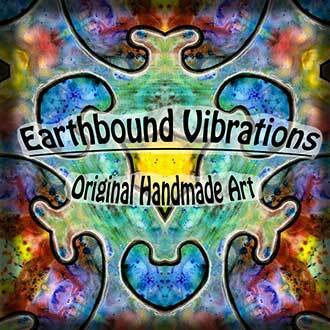 Thank you for looking into this for me as I would like to be on your mailing list for them . Hi Michelle, thanks for subscribing, I have you on my list! You only get emails when I post a new recipe, which usually happens once a month-ish.